This is our brand new 1.6 Gallon Harvest Fruit and Wine Press which is combined modern technology and old world tradition.You just load the crushed fruit into the barrel cage, ratchet down the press, and the juice is squeezed out of any fruits you like.So you can now begin your own traditions. 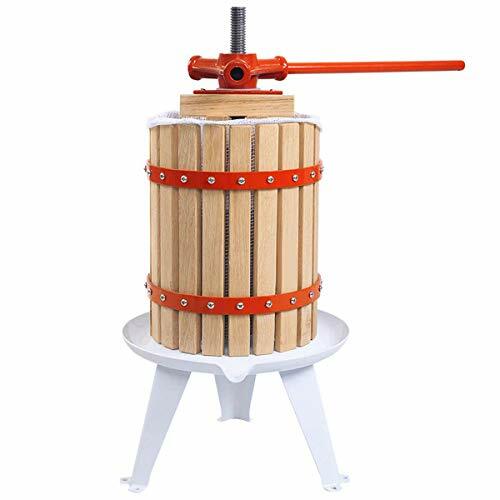 Large Capacity-With 1.6 Gallon capacity, this fruit and wine press is a great choice for you and your family to share abundant fruit juice or wine together. You can Do It Yourself and enjoy the happiness of squeezing well-content juice. Solid Construction- Made of oak basket which is moisture proof and resistant to insects (However, you'd better to keep it dry after usage for its longer lifespan). Equipped with easy pour bottom spout and enameled steel base which prolongs its service time. Easy to Operate- Load the crushed fruits into the barrel cage, ratchet down the press, and the juice is squeezed out smoothly. Easy to use and pressed your fruits to perfection - what a timesaver! Clean It Quickly-After finishing squeezing the juice, you can get the clearance under the drain easily.